After her father loses his job, Marlene returns to her hometown for work and reconnects with an old friend who could turn her life upside down. A Reunion of Hearts by Beth Wiseman Friends are rooting for an estranged couple to reunite...but will it be enough for them to get past their shared grief? A Chance to Remember by Kathleen Fuller An octogenarian matchmaker is surprised when a man from her Englisch past returns. What does the future hold for them—friendship or more? Mended Hearts by Kelly Irvin An unwed mother must decide between the child’s father, who once abandoned her, and a love-struck friend who has always supported her. 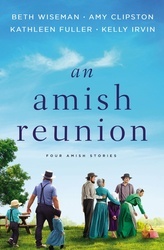 Amy Clipston is the bestselling author of the Kauffman Amish Bakery, Hearts of Lancaster Grand Hotel, and Amish Homestead series. Beth Wiseman is the award-winning author of the Daughters of the Promise, Land of Canaan, and Amish Secrets series. Kathleen Fuller is the author of several bestselling novels, including the Hearts of Middlefield, the Middlefield Family, and the Amish of Birch Creek series. Kelly Irvin is the bestselling author of the Every Amish Season and Amish of Bee County series.